Lapinette guided Jenny into the Carrot Club and introduced her as Cardoom of the Artichoke Club. 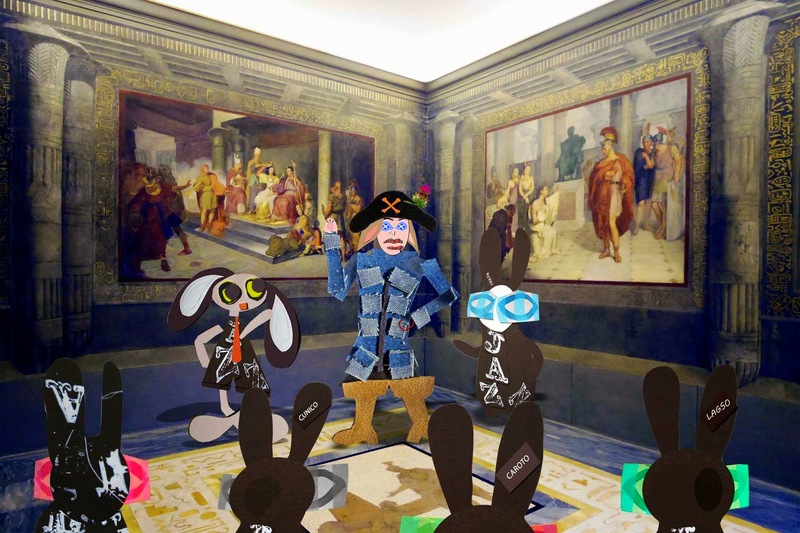 The Wabbit, although surprised to meet Jenny in this capacity, remained unflustered. Members gathered and rapt attention fell as Jenny began her address. "Members of the Carrot Club, thank you for your gracious invitation." We thank you, thank you!" cried Club members. "I apologise," said Jenny. "I'm unaccustomed to addressing illustrious gatherings such as this." A rustling of approval rustled round as Jenny began. "Carrots are well-rooted ..." The members nodded in agreement. "... while artichokes are all heart," continued Jenny. Members started to smile. "Some say artichokes are prickly." "No, never," cried the members. "But I say, they're soft inside," chortled Jenny. A smattering of pleasant laughter echoed in the high ceilings. Now Jenny raised a paw in pause. "We have many similarities." "What are they?" yelled Lagso. "Carrots and artichokes are nutritious and keep well." said Jenny. "Carrots are vitamin sticks." said Caroto." "Artichokes are a rich source of folic acid," retorted Jenny quickly. Jenny looked at Lapinette because she was running low on ideas. The Wabbit stepped in. "Cardoom, how shall we move forward?" "We must move forward with ... " Jenny faltered but Lapinette whispered something. "With meaningful priority!" commanded Jenny in an oratorical voice. Cheering broke out and Jenny turned to Lapinette. "How was that ... Mr Green?" "Awesome," said Lapinette.